Bottle-fed puppies are prone to getting air trapped in their stomachs, and could face discomfort or even health issues. Burping them after every meal is a quick and easy way to alleviate that pain, and then they can go right back to exploring and playing. 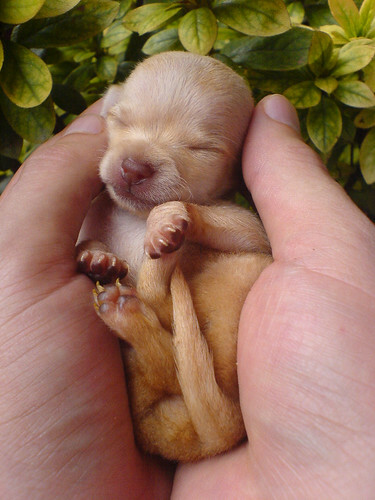 Step #1 - Pick up your puppy very gently after each meal. While not every puppy needs to be burped after every feeding, doing so for just a minute or two helps release trapped air. Puppies that are bottle-fed are especially prone to swallowing air, and burping them after they eat releases it. Step #2 - Hold the puppy up against your torso with his stomach pressed against you. He should be sitting upright with his face looking over your shoulder, similar to how you would hold a baby that needs burping. Step #3 - Gently but firmly rub up and down his sides and back to try to release the trapped air. If this doesn't result in anything after 30 seconds or so, gently pat him on the sides and back. You will eventually hear him burp a little, at which point you can put him back down on the ground.